This is the loose form of the above. Wash, clean and wipe with a dry clean cloth the green chillies and cut them after drying for a few minutes by removing the stalk. The pieces should be very small in size. Take oil in a kaDAi and add mustard seeds with fenugreek seeds. After spluttering, add the chilli pieces and sauté for 5 minutes. Extract tamarind juice with the help of 2 cups of water completely and add the extract to this. Allow boiling. Add salt, asafoetida powder and turmeric powder. 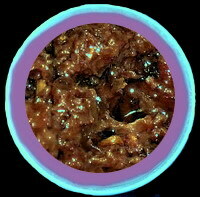 When it becomes thicker, add the jaggery shreds and after stirring constantly, when the contents leave the side and are appearing a sort of paste remove from the fire. When it is warm, add the pre dry roasted sesame powder and mix well. This also goes well with tOSai, plain rice and curd rice. Wash the chillies, clean and wipe dry as above. Dry roast cumin seeds, asafoetida and fenugreek and grind into a coarse powder along with mustard seeds. To this add turmeric powder, gram macula powder, sugar and salt and mix well. Extract lemon juice over a little salt and remove seeds. Mix a little juice to this powder along with 1 tbs of oil. Keep aside this paste. 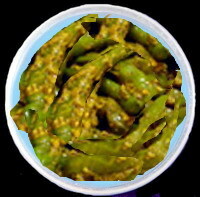 Slit each green chilli and fill up with the paste. Put these in a jar and mix with it the remaining lemon juice. Cover the mouth by a fine muslin cloth after doubling it. Tie it tightly and keep it in the sun for 2 days. Thereafter, remove the cloth and pour sufficient sesame oil as to submerge all the chillies below the oil surface. Close the mouth of the jar with an air tight lid and store in a cool place. Toss daily once with a dry spoon or ladle. 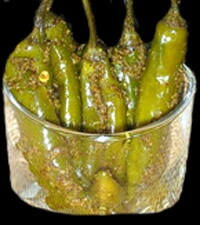 You can use it after the chillies become soft, say approximately after 20 days. Test this with a dry spoon or ladle. As in the case of pickle, check this once in a while and toss. Instead of using the whole chilli you can cut each into a piece of about ½ inch and follow the above procedure. Wash, clean and wipe the chillies with a clean cloth. Dry under ceiling fan. Cut into 1 inch long pieces. Put them in a jar. Dry roast kAlAjIrA, aniseed, coriander seeds, cumin seeds, fenugreek and Bishop’s weeds. After cooling, grind these into fine powder with turmeric powder, salt, sugar, rock salt, garam maSAlA and asafoetida. Mix these with the chilli pieces by tossing. Add citric acid crystals and again toss. Next day add the sesame oil to ensure that the chilli pieces are below its surface. Close the jar with an airtight lid and allow the ingredients settle into the pieces for about 25 days. You can then use. Never use wet ladle or spoon but use only dry spoon. The pickles can also be prepared with capsicum (bell pepper) but the shelf life of this will be too short as it has very soft skin. You also need not wait for more than 5 to 7 days for the ingredients to be absorbed in this case. This entry was posted on January 27, 2012 at 9:02 am and is filed under Indian Pickles with tags aniseed, asafoetida, Bishop's weeds, citric acid crystals, coriander seeds, cumin seeds, fennel seeds, fenugreek powder, garam masala powder, green chilli pickle, green chillies, Indian pickles, jaggery, kala jeera, kala namak, kalonji, lemon, milagai pachchadi, milagai urugai, mustard seeds, north Indian green chilli pickle, refined oil, rock salt, Shimla chilli pickle, stuffed chilli pickle, sugar, table salt, tamarind, til oil, turmeric powder, white sesame oil, white sesame seeds. You can follow any responses to this entry through the RSS 2.0 feed. Both comments and pings are currently closed.